For years, thanks to Campbell’s, I thought I hated tomato soup. Then I went to Europe. When I was backpacking through Austria, tomato soup was one of the most reliably vegetarian and cheap items on the menu, so, in the spirit of trying new things and eating on the cheap, I tried it. Well, it turns out those Austrians know a thing or two about making incredible soup. I ate pretty much nothing else the entire time I was there (well, that and bread and cheese, of course). Anyway, when I got back to Canada I set out to try and find a reliably good tomato soup recipe. So far, I haven’t found anything as good as the Austrian soup (I should say, though, that it’s just as delicious and consistent in Switzerland, so maybe there’s a skiing connection? ), but I do have a couple of good ones to fall back on. My first foray into tomato soup making was four years ago via the New York Times. It was right around the time they started their ‘Recipes for Health’ series, and they posted a recipe for Roasted Tomato Soup. It is delicious (although I always use stock, not water), but it can be pretty time consuming to roast and peel all those tomatoes. I also ruined several baking sheets before I realized I could use a pyrex dish just as effectively. Lately, though, I’ve been mixing it up. First was that Georgian Tomato Soup with Walnuts and Vermicelli, which was very rich and meaty-tasting, despite being completely vegetarian. Anyway, when I had friends over for dinner on Saturday I thought about making that again, but since I was also going to make the Khachapuri, I thought I should at least change up the soup. So, I went looking for a new recipe. 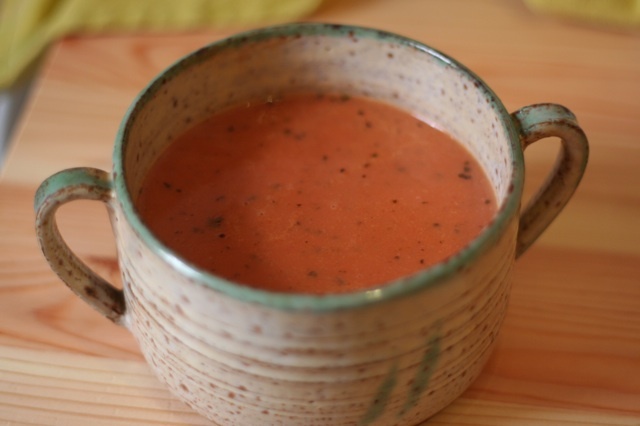 I scanned through a lot before settling on The Kitchn’s Cream of Tomato Soup. It wasn’t too time consuming (good if you’re having people over) and sounded like it might get me in the neighbourhood of my European dream soup. 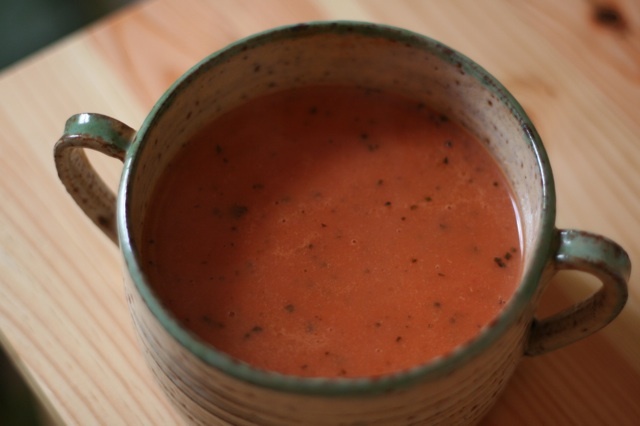 I used tomato passato instead of canned tomatoes – there are fewer preservatives and, for a pureed soup, it makes for a very smooth texture – and since I didn’t have any dried basil I just subbed in some dried oregano; I also left out the celery, because I didn’t have any. Delicious, and a perfect match for the Khatchapuri – who doesn’t love tomato soup and something grilled cheese-esque? I didn’t take pictures on Saturday, but it was so good and there weren’t any leftovers, so I made it again today. In the meantime, I bought some basil, so I used that and dried oregano. I also added a swizzle of olive oil, a little bit of honey, and some leftover (frozen) puréed Marzano tomatoes (ostensibly pizza sauce). For a richer taste, I think 35% cream would be ideal, but we only had 1% milk, so I used that. Anyway, if you’re in the mood for an easy and very yummy soup, add this one to your repertoire. This soup is even faster if you have stock on-hand. I usually try to make big batches so I have some in the freezer when I feel like soup. Put everything into a big pot and bring to a boil, then turn down the heat and simmer for an hour or so. Strain and you’re finished! Use it warm right away or cool completely and then freeze. To give it more body, I recommend adding mushrooms (or, just the stems, if you have them – just make sure to wash them well).